Cured ceramic coating prevents damage to clothes during long rides. 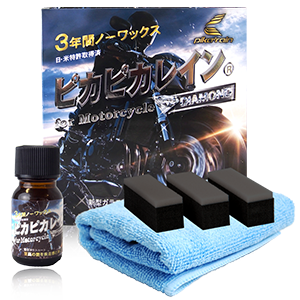 Pika Pika Rain Ceramic Coating for Motorcycle is 10ml version of Pika Pika Rain PREMIUM Ceramic Coating. You can apply not only a motorcycle but also a light vehicle, and for partial application on cars. Pika Pika Rain Ceramic Coating for Motorcycle forms a 100% genuine glass coating on your car body by reacting with moisture in the air. Once cured, the glass layer protects the car body for up to 3 years. The glass layer produces a luxurious gloss and provides excellent water repellency on your car body. Pika Pika Rain Ceramic Coating for Motorcycle can be applied to engine, plating and aluminum parts to prevent rust and small scratches. Harmful particles won't stick to the surface as easily so maintenance will be much easier. To easily remove dirt and other particles, just wash your car with water and wipe with a microfiber cloth, without the need for car shampoo. Unlike wax or polymer coating, Pika Pika Rain Ceramic Coating for Motorcycle cures completely and won't get your clothes dirty by rubbing off during long rides. Traditional car wax or car sealant look okay at first, but their luster fades quickly and water repellency only lasts a few months. Pika Pika Rain Ceramic Coating for Motorcycle’s glass layer lasts up to 3 years, maintaining the luxurious glow on your motorcycle! Additionally, Pika Pika Rain Ceramic Coating for Motorcycle water sliding effect repels water and helps block dirt or other particles from sticking to the surface of your motorcycle.